This week at Bah! Humbug! we are to create a Christmas scene. I thought this would be a good opportunity to practice with My Digital Studio. The background paper is Always Artichoke with white dots, the scallop at the bottom is cherry cobler scallop punch, and the scallop oval punch is cherry cobler with the sentiment on top. I printed this panel and trimmed slightly for my 4 1/2" X 5" card front, before adding the cherry cobler mat and adhering it to the card I drew the pond edges, masked the couple and the scallop tag and stamped the trees with Lovely as a Tree stamp set. Here comes your artistic eye--you have to envision the pond because I didn't make it blue and the dots look like snowflakes coming down. Supplies: Cream Card Blank 4 1/2" X 5" Halcraft, Background, skaters, scallop oval, sentiment created in My Digital Studio Stampin Up, Stamp: Stampin Up-Lovely As A Tree, ribbon-American Crafts Elements, Ink: Ranger Archival Ink-Jet Black. Great use of the My Digital Studio software and I love the color combo of Always Artichoke and Cherry Cobbler. It's nice to think of snow and ice when it's almost 100 degrees in Texas LOL! Beautiful card. Love the stamping of the 'scene'. The pond just looks like it is covered in snow. Great scene Bev and very cleverly put together. Fabulous as always Bev. I love the colours you have used and how you have combined digital and traditional stamping techniques to create your scene. Thank you for sharing with us at Bah! Humbug! 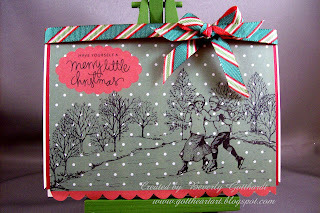 Wow, your card is just amazing I love every single detail, it's a fabulous Christmas scene and perfect for our challange.